Vote to Keep the Coop Relevant for You! When the Coop originally opened in 1882, students could buy items like firewood and coal to keep their rooms warm. Well, the Coop no longer sells coal or firewood -- the Coop has needed to adapt to stay relevant in students' lives. You need student representatives on the board who will actively solicit student feedback and represent a wide variety of students and student interests. My Harvard-wide student involvement and experience make me the perfect fit to represent you on the Coop Board of Directors. My combination of campus involvement and service create a unique opportunity to interact with a wide variety of students. I currently serve as the student president at the Harvard Extension School (HESA). I originally studied as a distance-only student living in California - and I was actually elected student president while living in California. I interact with students from every graduate and professional school through my work on the Harvard Graduate Council (HGC). I have been actively involved in planning academic and social Harvard-wide events (See http://HarvardBall.com) - bringing students together from every Harvard school. In addition to campus experience, I will also bring professional design, marketing and technology experience to the Coop. 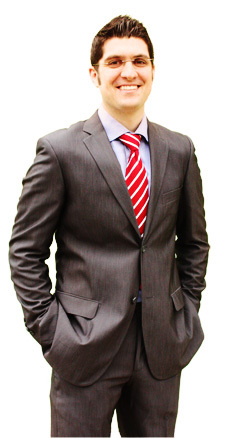 I've managed many international branding, identity and marketing campaigns – print, web and interactive. I own a design/marketing firm and I manage digital media training across the US. I believe we need to continue improving communications with all students across the Harvard and MIT communities. We should continue creating more awareness through various media channels: website, social media, video, iTunes podcasts, university / community press and more. But not only should we improve communication to the student community for better awareness, we should actively solicit and survey students--students like you--to understand how the Coop can better meet your needs and stay relevant in your life. Keep the Coop Relevant to You! As I have continued meeting Harvard and MIT students during the campaign, I have asked each one: "What would make the Coop more relevant in your life as a student?" I have received some great ideas and feedback such as: "add a student-only lounge" or "add more items I can currently only buy at Target" or "change the book buy back program" or "offer more online" or "change the Coop hours" or a big one… "the books are too expensive - cut the prices." These are just a few of the great ideas and thay are all important issues we need to address this year. The Coop is at a pivotal point in its history. As one example, if the Coop cannot find a way to cut textbook prices and compete with students going to Amazon, the Coop may need to drastically reevaluate its business strategy. In that regard, I believe the most successful strategy will be based on your needs as students. I look forward to working with you this year to keep the Coop as a central hub of student life and relevant for you. Thank you for your support on the ballot and email me anytime. Thanks! What would make the Coop more relevant to you? 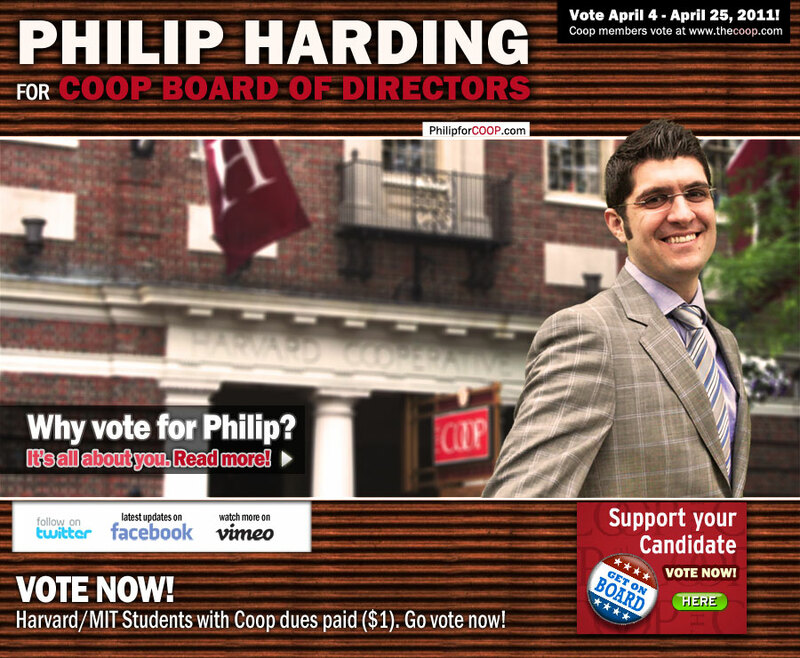 http://PhilipforCoop.com - President, Harvard Extension Student Association. Harvard-wide student leader. Founder of the Harvard Masquerade Ball - http://HarvardBall.com - Entrepreneur. Community leader. Energetic, passionate and optimistic about the Harvard student community. Will bring business, design, marketing and technological experience to continue the Coop's mission serving Harvard and MIT student communities.